Until A&C came along, I never realized how much of parenting is sort of . . made up as one goes along. It’s not like I thought each baby would pop out with an individualized owner’s manual (too bad), but it just hadn’t occurred to me that every new stage would bring on new challenges that I had zero experience with. This is true especially with child #1, but even parenting two at once is brand new at every stage — getting them to play peacefully together, for example. Most of the time I just go with a lot of trial and error, with a dash of wisdom from more experienced parent friends (IRL or online) and the occasional parenting book thrown in for good measure. So, that explains why I picked up Simplicity Parenting. You all know I am enamored by all things minimalist, even if our lifestyle does not always meet strict simplicity criteria*. In the end, I found it to be a useful and worthwhile read, and also one that gave me some warm-‘n’-fuzzies while reading it. You can tell that the author (Kim John Payne) truly loves and believes in children. He also believes in discipline, structure, and limitations, but the overarching tone feels loving to me, which I have found is not always the case in parenting books. By section, here are a few of his themes and the highlights I found most interesting/useful. Please note that there are plenty of recommendations that I have yet to try, either because I just haven’t gotten around to it yet, or because A&C haven’t met the appropriate developmental ages. Payne opens with a section called “Soul Fever”, which takes the reader through the overscheduled/overstuffed/overstimulating nature of many kids’ lifestyles and the resulting problems that may ensue. The next several sections contain the meat of his recommendations, divided into several realms. Here we go . . .
A dozen or fewer!? This was shocking to me and I do not intend to cull the libraries of either kid significantly, as I always felt happy having a full bookshelf growing up, and would revisit old favorites randomly time and time again. He also suggests avoiding books based on product or television character. Umm, yeah, Disney has won over Annabel (and Cameron is drawn to Elmo, in that preternatural way that all 2-year-olds seem to be). What can I say? So I will not be removing the princess or Sesame Street storybooks anytime soon . . . Rhythm: I love this chapter, because rhythms and schedules always fascinate me. It always boggles my mind how we can be thoughtless and automatic about events that occur EVERY SINGLE DAY. I know that “intention” is such a buzzword right now but I don’t care — I love it. * Spending some time the night before going through the next day’s events with your child. I admit I don’t always do this with Annabel, and it must be disorienting for her to wake up and not know if she has school! She often will ask me, “Do you have to go to work today?” and when I say “yes” it starts the day off with a disappointment. So, I’m going to try reviewing with her the next day’s events at bedtime. * Instrument practice in the morning. Okay, A&C are too young to have instruments, but if/when they choose to, I think this is the best idea! Get it out of the way while everyone is fresh and not have ‘piano practice’ hanging over anyone’s head at the end of the day. * Involving kids in food prep. I’ve been on a ~2 year cooking strike (I admit) but hopefully at some point it will come to an end. Would love to involve A&C in prep. * Rotation of predictable meals. Interesting! He suggests that you do something to the effect of Monday pasta, Tuesday Mexican, Wednesday soup, etc. I suppose we already do that to an extent (salmon / fish on Mondays, usually, and takeout on Saturday night). * Rhythmic “pressure valve” releases built into the day — expected down time. May take form of a nap, an afterschool snack, quiet reading time, etc depending on the ages of the kids. Schedules: Here, Payne makes an analogy between childrens’ activities and rotation of crops. Since I’ve never farmed anything in my life, this didn’t really grab me, but there were some good takeaways. It is definitely true that children — even young ones — are scheduled to an extent they never were before. So many structured “classes” “teams” “lessons” — even for 2 year olds! And I’m guilty, because C is in gymnastics and has already done soccer, and A does ballet. Oh, plus swimming! So, yeah. But is that too much? How much is too much? This is addressed in the chapter. 1) Leisure and rest (“fallow field”). Includes hanging out, just “mucking about”, resting, casual play. 2) Deep play (“cover crop”). Includes creative play (intensely working on an art project or a puzzle, for example). To me, these sound like “flow”-inducing activities. 3) Activity (“crop field”). Sports teams, school, chores, scheduled social events, “daily life” busyness. He advocates for a careful balance between these 3, and for letting kids be (horrors!) bored sometimes. He suggested meeting complaints of boredom with a neutral, rather cryptic-sounding phrase: “Something to do is right around the corner”, or doling out chores as suggested activities (kids will all the sudden find something very important/exciting to play with). He mentions cultivating “Sabbath moments”, in either a religious or completely secular sense. I am not religious but I am so attracted to the Sabbath idea, especially as it might lead to more intentional unplugged time and family connection. I also like the idea that spacing out activities allows for more anticipation — if a kid is bouncing from one big “SPECIAL EVENT!” to another, nothing is special anymore. Too many high notes lead to an addictive rhythm that is impossible to sustain. Finally, there is a discussion about sports and how many athletes with very intense involvement early on (I’ve seen this a lot in patients who do gymnastics!) there is early burnout and then no athletic participation in later years when it is the most valuable (ie, in high school/later adolescence). Filtering out the Adult World: Kids are not meant to spend their days ruminating about terrorist threats and financial difficulties — and yet somehow many of us let these sneak into adult conversation when they are around. I know I am guilty of this, and A listens to E.V.E.R.Y.T.H.I.N.G. And she really thinks about things. The other day she asked me: “When Cameron and I grow up and are not kids anymore, and you don’t have any more kids, will you be sad?”. Um, woah. 1) Limiting (or avoiding entirely, really) TV. I still let A watch one show daily. So I guess I am ignoring his advice. But it’s still just one (child-appropriate) show in the afternoon while Cameron naps. We will have to see what happens once he drops it. 2) Avoiding helicopter parenting. Check. I don’t think Josh or I are helicopters in the least. 3) Listen, don’t overtalk. Avoid getting into adult subjects or stressful topics around children. And in talking with them, ask yourself: “Is it true? Is it necessary? Is it kind?”. WHEW. That might be the longest post I have written in months. (Or ever). But I found a lot of value in Payne’s book, and am even glad I took the time to make this outline, because I want to put more of his strategies into action. I will say that his book is more anecdotal and not research based, but his ideas are interesting and many resonated with me, and he has the right voice in how he explains things — for me, anyway. Would love to hear others’ thoughts on the book, or on the ideas above. * Although we still do not have a closet! That has to count for something. ** Actually she usually does about 10.5. ~8p – 6:30a. I guess that is not too far off. Interesting post! Routines are everything in our household. We do chores together as a family on Saturdays, and our oldest always groans about it. But then we missed a couple of weekends due to travel, etc, and he actually asked, "Mom, remember Chore Challenge? When are we going to do that again?" So even the routines they dislike seem to matter! One thing I wish I could be good about is the toy rotation. I have tried several times and just never keep up with it. But I do think it would be really helpful for kids. I think the environment recommendations are BS. Have you read Freakonomics? That’s where I saw research that kids who are strong readers are not those who are constantly read to or those who are often taken to the library, but those who are surrounded by books, so the books are a natural part of their surroundings. That’s right — you can read to the kid all you like, it they don’t think books naturally belong all around them they won’t end up as strong readers. And as for play, I really don’t think we should interfere too much with how the kids play or with what. We have a ton of toys. many in the living room, even more in the basement. The kids occasionally go get some toys from the basement, but generally play over and over with whatever is around, and in ways that people can’t imagine. But I do strongly agree that kids like predictability: for instance, if I am going out of town I make a point of telling each that I will gone the next day, and when I would be back; they need to have some time in the morning to watch a cartoon and eat breakfast and don’t respond well if I rush them. I haven’t read this book, but I think if he claims that you should only have a few books around for kids, that right there would make me skeptical. I know the idea of "simplicity" and essentialism, and less, and such are all hot topics right now, but very few children (per time diaries of children’s lives) actually have packed schedules. It may be some tiny slice of the population, but the average child might benefit from more activities. The book suggestion is so unrealistic! Like others have said I grew up surrounded by books and want the same for my kids. BUT I really love the rest of the book, especially the reminders that rhythm and predictability are good for children. His points about media, unstructured time and open ended play are spot on. Even when having a lot of unstructured time is hard for me (because I have a 3 year old badgering me for company) I know it’s good for him to have that. I had a lot of unstructured time as a kid and I’m so, so glad I did. And about tv — I’d say that if Annabel just watches one show a day while Cameron is napping, that’s limited enough! I noticed a big positive change when we drastically reduced the amount of tv Will watches. 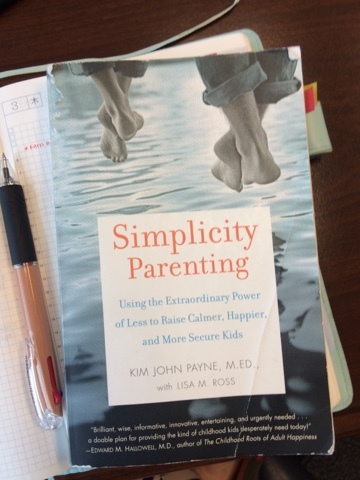 I have read Simplicity Parenting twice now and have gotten a lot out of it. I also read Payne’s new book, The Soul of Discipline, which I also really liked — it’s worth looking at. We certainly have more than a dozen books (many, many, many more) but I have found that as my kids get older I certainly cannot buy/store/keep all of the books they like to read. Especially now that they don’t always want to re-read books. The cost would be astronomical, the book clutter would be out of control and I would need an entire room just to store the books. We use the library a lot. It allows my kids to have a great variety of books around them, costs nothing and doesn’t contribute to permanent clutter in the house. We still buy certain books (the Magic Treehouse series for example) but the library is our go to. I also rotate our seasonal books. Holiday books only come out in the month of that particular holiday. This also cuts down on the book clutter that is out at any given moment. 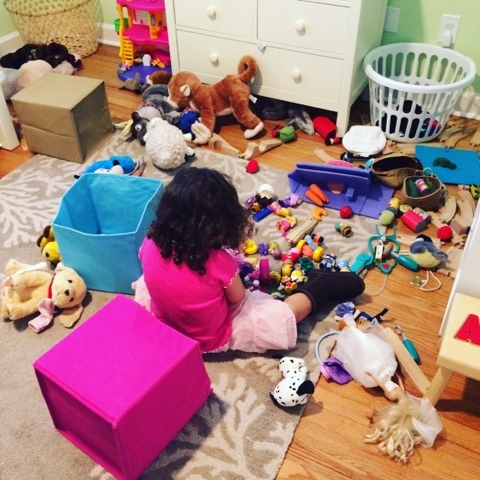 I liked a lot of parts of simplicity parenting (routines, rhythm, structure, sleep) and other parts I just had to let go as not being a good match for my life. I think that is a good philosophy for most parenting books though. Take away what seems like it will help your life and let the rest go. I actually just read Soul of Discipline (Kim John Payne’s newer book). I liked it less than Simplicity Parenting. The developmental ages and stages for discipline were interesting but I felt a lot of it wouldn’t work well in our family. Now i want to share a great information for parents. At present typeressay is writing great essay for the children. Now most of the parents like their essay and they assign them for write a fantastic essay. Hope you will feel fine for their on line service.